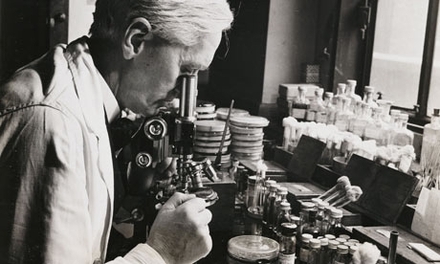 Microbiologist, Prof Edmund Smyth will be delivering a presentation on the history of the development of antibiotics at a free public meeting hosted by Royal College of Physicians Ireland on Tuesday January 14th at 6 Kildare St Dublin, at 6pm. All welcome. Tea and coffee will be served. Prof Smyth’s presentation is part of an RCPI event entitled: Good bugs, bad bugs and super bugs - Protecting you and your family from infection. "I stood on the rooftops in the gathering gloom. Dublin Burning! What a sight! Gruesome. Awe-inspiring. Man's inhumanity to man - there is nothing so brutal and callous in all creation." 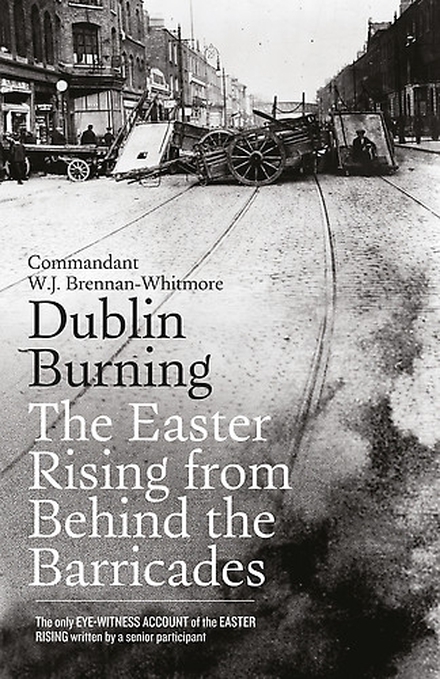 The words there of Commandant WJ Brennan Whitmore who was in charge of a small outpost in North Earl Street across the road from the GPO during the Easter Rising. His memoir was our January Book Club choice. Written in 1961, this is the only eye witness account of the Rising by a senior participant. University of Limerick historian, Ruan O Donnell, Anne McLellan and Irish Times journalist, Peter Murtagh discussed the book. They first talked about William James Brennan-Whitmore’s childhood in Wexford and how he learned his nationalism from an Irish missionary priest, Dr. John Mullan at the foothills of the Himalayas. No other senior Volunteer figure has left a similar memoir of Easter Week. Commandant W.J. Brennan-Whitmore was officer commanding the Volunteer position at the head of North Earl Street, an outworking of the GPO garrison. Its purpose was to delay and frustrate any attempt by the British to deploy reinforcements coming from Amiens Street railway station (now Connolly). Commandant Brennan-Whitmore and his men held this position for over seventy-two hours until forced out by British artillery. He and his troops attempted to retreat northwards through the slums, hoping to reach the safety of the suburbs. But he and his men were not Dubliners and were unfamiliar with the city. They were captured in a tenement where they had taken refuge and were interned in Frongoch in Wales until 1917. 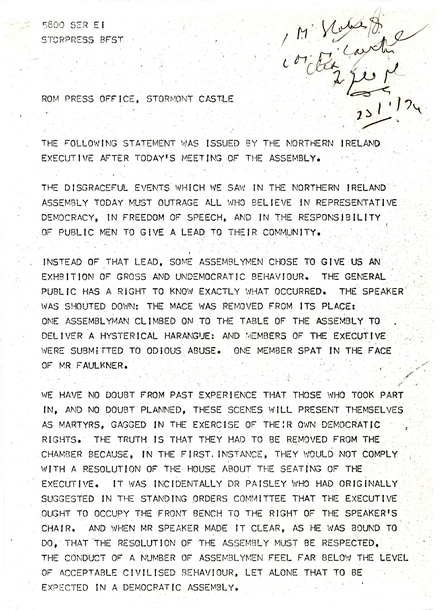 40 years ago this month, the Northern Ireland Executive declared 1974 as the Year of Reconciliation in the North. The first attempt at power-sharing in the region began on the 1st of January which meant that there would no longer be majority rule. 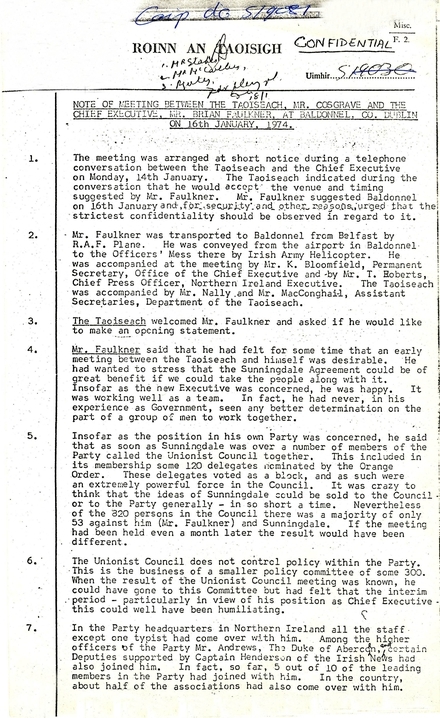 The power sharing executive was established on foot of a number of initiatives involving the British, and later the Irish, governments which culminated in the Sunningdale Agreement of December 1973. 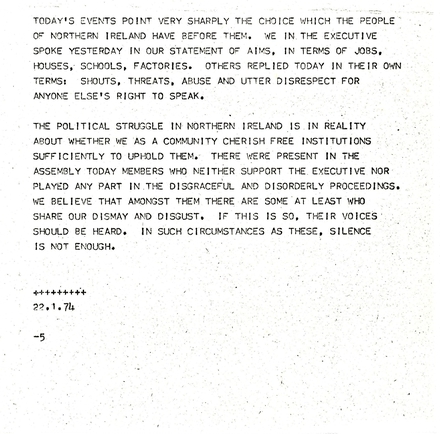 Catriona Crowe has dug up some documents from the National Archives relating to this time which you can find below. She spoke on the programme about the background to and end of the doomed 1974 power sharing executive. 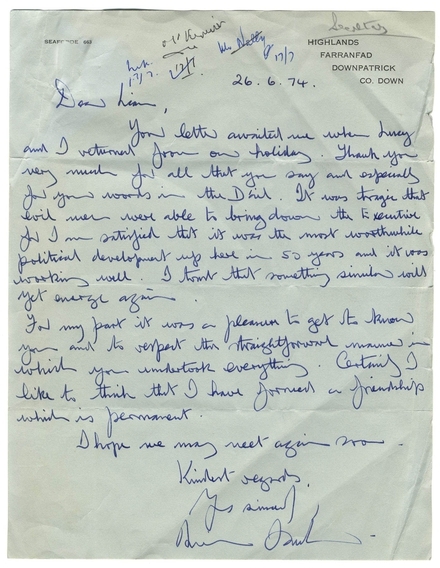 Letter from Faulkner to Cosgrave, 26 June 1974, hoping their friendship will continue. 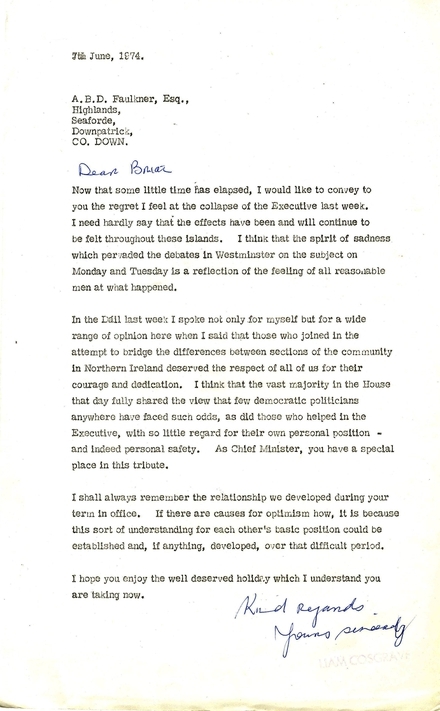 Letter from Cosgrave to Faulkner, 7 June 1974, expressing regret at the downfall of the Executive. 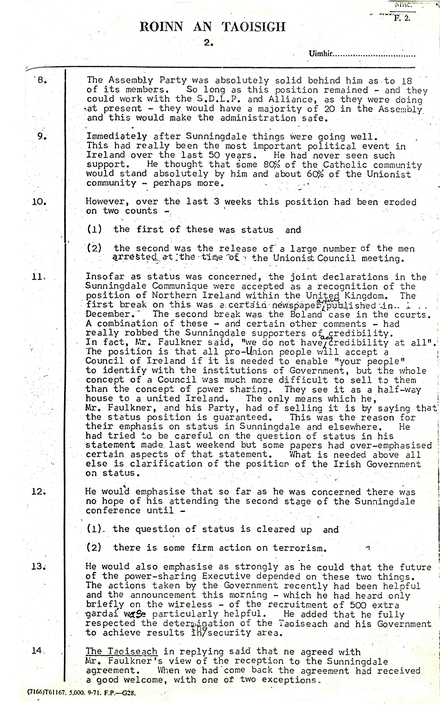 Two pages of a Department of An Taoiseach memo on the meeting between Brian Faulkner and Liam Cosgrave 16 January 1974, full of optimism that the Executive will work. Last month (December22) marked the 150th anniversary of the death of Michael Corcoran. Michael Corcoran was a Sligo man who lived the last 14 years of his life in America. 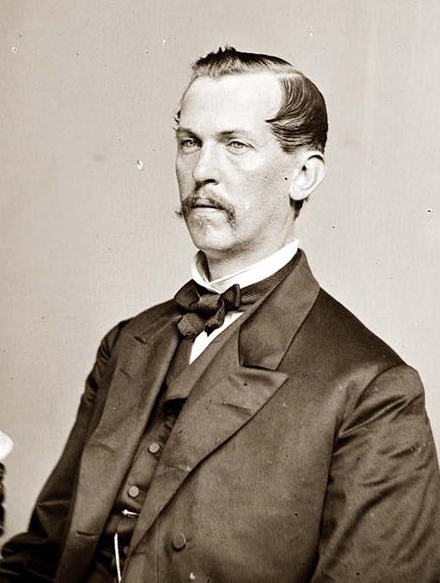 During that time he would led the 69th and then his own regiment into battle in the American civil War. But he is perhaps best known for a stance he took in New York during the visit of a teenage prince. 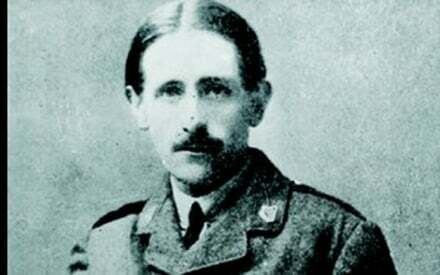 Orla Rapple found out more about Brigadier General Michael Corcoran. 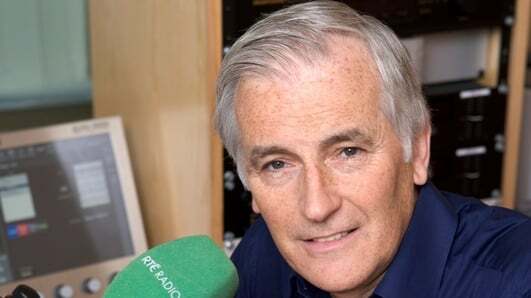 Orla Rapple's report on the life of Michael Corcoran was part of her series Irish Fighter’s, American War which was funded by the Broadcast Authority of Ireland with the Television License Fee. 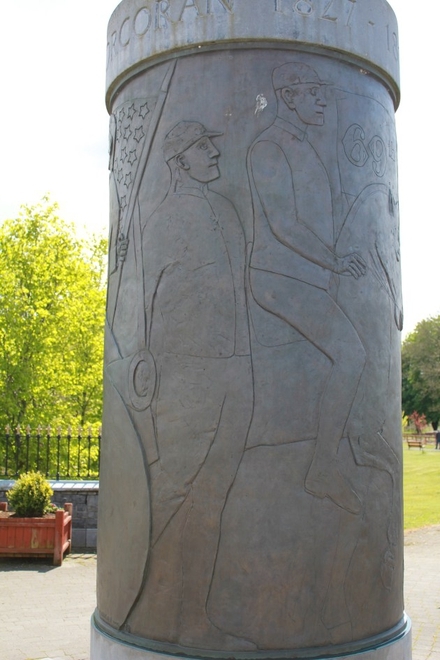 The memorial erected for Michael Corcoran and the Fighting 69th can be found in Ballymote. 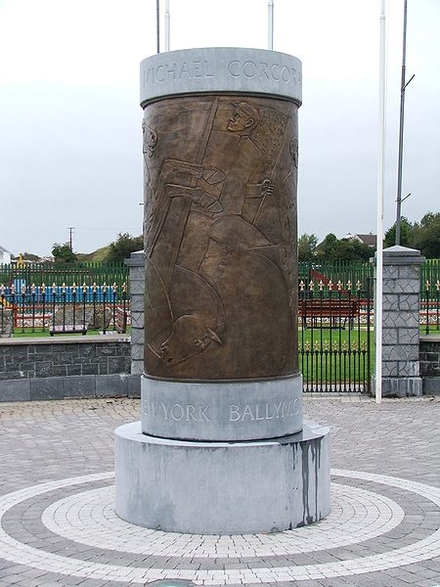 This memorial also contains a fragment of steel from the World Trade Centre, to commemorate Firefighter Michael Lynch who died on 9/11. 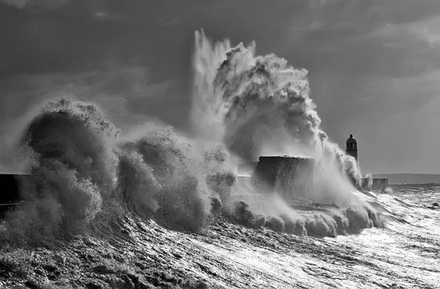 The storms that have been lashing the South and West Coasts this week have caused untold disruption and damage which will cost millions to repair. Coincidentally perhaps, this week 175 years ago on 6 January, 1839, the most devastating storm ever recorded in Irish history swept through the country. Turtle Bunbury read an extract from his article below for The History Show. But back on 6th January 1839, the entire island of Ireland was subjected to a tempest of such ferocity that it became the date by which all other events were measured. The Night of the Big Wind - known as ‘Oiche na Gaoithe Moire’ - was the JFK assassination or the 9/11 of the 19th century. It was the most devastating storm ever recorded in Irish history and made more people homeless in a single night than all the sorry decades of eviction that followed it. And if there was one place you didn’t want to be that dreadful Sunday night, it was inside a wooden cabin in County Mayo. The calm before the Big Wind struck was particularly eerie. Most of the eight million people living in Ireland at the time were preparing themselves for Little Christmas, the Feast of the Epiphany. The previous day had seen the first snowfall of the year; heavy enough for the Mooneys to build their snowman. 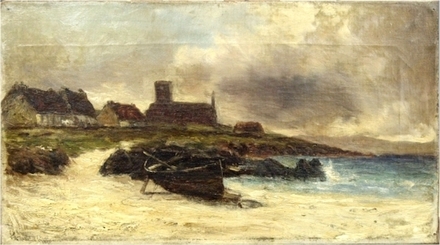 By contrast, Sunday morning was unusually warm, almost clammy, and yet the air was so still that, along the west coast, voices could be heard floating on the air between houses more than a mile apart At approximately 3 o’clock in the afternoon, the rain began to fall and the wind picked up. Nobody could possibly have predicted that those first soft raindrops signified an advance assault from the most terrifying hurricane in human memory. It hit Ireland’s west coast with such power that the waves actually broke over the top of the Cliffs of Moher. 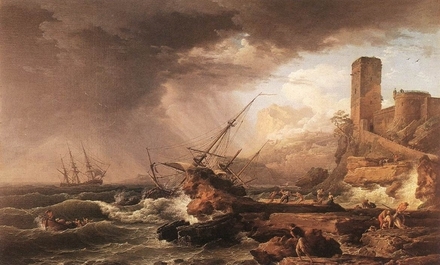 Reading contemporary accounts, the impression is that if we did not have such magnificent cliffs forming a barrier along our west coast, the entire country would simply have been engulfed by water. The noise of the sea crashing against the rocks could be heard for miles inland, above the roar and din of the storm itself. The earth trembled under the assault; the ocean tossed huge boulders onto the cliff-tops of the Aran Islands. Perhaps the most terrifying aspect of the hurricane was that it took place in utter darkness. People cannot have known what was going on. The wind churned its way across the land, extinguishing every candle and lantern it encountered. The darkness was relieved only by the lightning streaks that accompanied the storm and the occasional blood-red flicker of the aurora borealis burning in the northern sky. 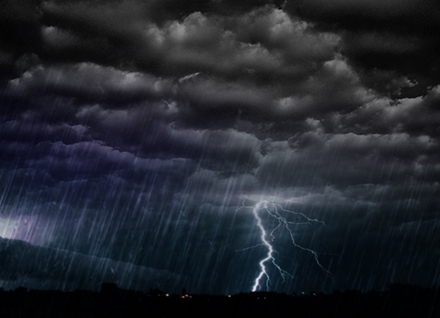 All across the country, hundreds of thousands of people awoke to the sound of the furious tempest, their windows shattered by hailstones, their brick-walls rattling, their rain-sodden thatched roofs sinking fast. As the wind grew stronger, it began to rip the roofs off houses. Chimney pots, broken slates, sheets of lead and shards of glass were hurtled to the ground. (Rather astonishingly, someone later produced a statistic that 4,846 chimneys were knocked off their perches during the Night of the Big Wind). It stripped the earth alongside the River Boyne, exposing the bones of soldiers killed in the famous battle 150 years earlier. Roads and railway tracks in every parish became impassable. All along the Grand Canal, trees were pulled up by the roots and hurled across the water to the opposite bank. The Mooney’s timber cabin was one of thousands destroyed by the storm. Surviving inhabitants had no choice but to flee into the pitch-black night in clothes that were presumably soon utterly drenched by the intense rains and snows which accompanied that cruel, piercing wind. The Mooney family sought shelter in a hedge outside Castlebar; they survived the night but the parents caught a fatal fever and died soon afterwards, leaving five homeless orphans. Stuffle was not the only man who believed the hurricane, occurring on the night of the Epiphany, was of Divine origin. Many saw it as a warning that the Day of Judgment would soon be here. Some believed the Freemasons had unleashed the Devil from the Gates of Hell and failed to get him back in again. Others maintained this was simply the night the English fairies invaded Ireland and forced our indigenous Little People to disappear amid a ferocious whirlwind. (Irish fairies, of course, are wingless and can only fly by calling up the sidhe chora - the magic whirlwinds). The well-to-do did not escape; many mansions had their roofs stripped off. Lord Castlemaine was fastening his bedroom window when the storm blew the windows open and hurled him ‘so violently upon his back that he instantly expired’. His brother-in-law, the Earl of Clancarty, later reported the loss of nearly 20,000 trees on his estate at Ballinasloe. Similar figures came in from other landed estates in every county; one landlord declared his woods were now ‘as bald as the palm of my hand’. On January 6th 1839, timber was a valuable commodity. 24 hours later, so many trees had fallen that timber was virtually worthless. Millions of wild birds were killed, their nesting places smashed and there was no birdsong that spring. 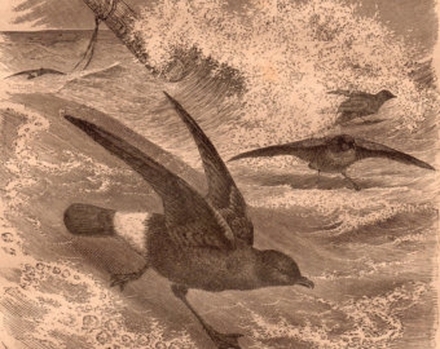 Even crows and jackdaws were on the verge of extinction. In his hotel room in Glendalough, John O’Donovan was fortunate not to share Lord Castlemaine’s fate. 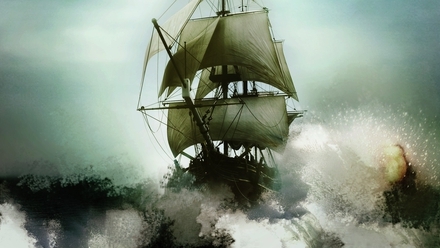 He was struggling with the shutters when ‘a squall mighty as a thunderbolt’ propelled him across the room. When he viewed the damage next morning, he described it as if ‘the entire country had been swept clean by some gigantic broom’. Dublin resembled ‘a sacked city …the whirlwind of desolation spared neither building, tree nor shrub’. The Liffey rose by several feet and overflowed the quay walls. The elms that graced the main thoroughfare of the Phoenix Park were completely levelled, as were the elms at the Royal Hospital Kilmainham. The trees on Leinster Lawn outside the present-day Dail were unrooted and scattered ‘like prostrate giants on their mother earth’. The back wall of the Guinness Brewery collapsed killing ‘nine fine horses’. A witness next morning described how ‘the noble animals [were] stretched everywhere as if sleeping, but with every bone crushed by the ponderous weight of the wall’. Military sentry boxes were blown off their stands and ‘scattered like atoms’. A glass shop on Nassau Street became ‘a heap of ruins’. On Clare Street, a chimney collapsed on a woman who had only just got into her bed, killing her instantly. Police stations and churches opened the door for thousands of terrified citizens who brought their young and frail in for protection. 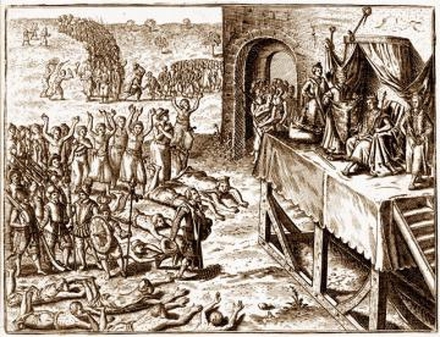 Even churches could not be trusted on this night of Lucifer. The steeple of Irishtown chapel caved in and the bell from the spire of St Patrick’s Cathedral came down like a meteorite; mercifully nobody died in either instance. Phibsborough Road was a bombsite of exploded windows and fallen chimneys ‘as if by shot and shell’. Estimates as to just how many died that night vary from 300 to 800, an astonishingly low figure given the ferocity of the storm. 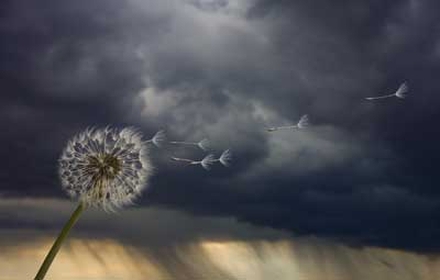 Many more must have succumbed to pneumonia, frostbite or plain old depression in its wake. Those bankrupted by the disaster included hundreds who had stashed their life savings up chimneys and in thatched roofs that disappeared in the night. But perhaps the most unlikely beneficiaries of the Night of the Big Wind were those old enough to remember it when the Old Age Pensions Act was enacted in January 1909, 70 years after the event and 105 years ago this month. The Act offered the first ever weekly pension to those over 70. 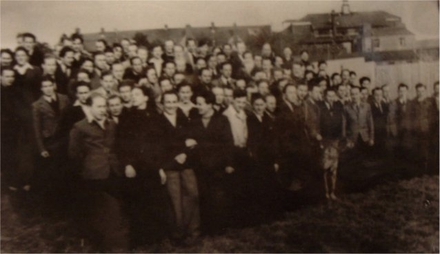 It was likened to the opening of a new factory on the outskirts of every town and village in Britain and Ireland. 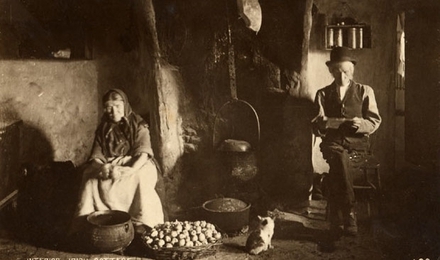 By March 1909, over 80,000 pensioners were registered of whom 70,000 were Irish! When a committee was sent to investigate this imbalance, it transpired that few births in Ireland were ever registered before 1865. As such, the Irish Pensions Committee decreed that if someone’s age had 'gone astray' on them, they would be eligible for a pension if they could state that they were ‘fine and hardy’ on the Night of the Big Wind. One such applicant was Tim Joyce of County Limerick. 'I always thought I was 60', he explained. 'But my friends came to me and told me they were certain sure I was 70 and as there were three or four of them against me, the evidence was too strong for me. I put in for the pension and got it'. "In Ireland, the storm seems to have been even worse than in this island [ie: Britain], and particularly at Dublin which in many places presented the appearance of a sacked city. Houses burning, others unroofed, as if by storm of shot and shell, a few levelled with the ground with all their furniture within, while the rattling of engines cries of firemen and labours of the military resembled the very aspect and mimicry of war. The Bethesda Episcopal chapel and the three adjoining houses were burned to the ground. In Sidney avenue, in the house of Mr Collins, a servant boy and a woman were killed by the falling of a stack of chimneys, and among the most serious sufferers by the gale was Mr Guinness the eminent brewer. The back wall of a large stable on his premises was blown in by the violence of the wind burying under its immense weight nine fine horses. The ball which surmounted the spire of St Patrick's cathedral was blown down as was a portion of the steeple of Irishtown church and Phibsborough church was much injured by stones falling on the roof. The streets were covered with such quantities of broken slates and tiles that they looked as if they were prepared for Macadamisation. The trees in the Rotunda gardens were torn up by the roots. Lady Mountjoy's house was nearly destroyed by the falling of a stack of chimneys and the house of the late lamented Lord Norbury suffered in a similar manner. In Athlone from forty to fifty houses were blown down. Major Gen Sir Parker Carroll, commanding the district, narrowly escaped being crushed by the fall of a stack of chimneys whilst Lord Castlemaine, less fortunate, whilst fastening his bedroom window at his seat Moydrum Castle co Westmeath was thrown so violently on his back that he instantly expired. Entire ricks of hay and corn were carried across the Shannon. The town of Loughrea is nearly all destroyed seven houses burned and 100 levelled to the ground. In the town of Moate 70 houses were consumed. Tullamore is literally devastated. At Garbally, the estate of Earl Clancarty, not a tree is left standing. Two thousand trees at the seat of the Bishop of Meath, Ardbraccan, were blown down.